The Fork and Broom Press is a place of book arts. 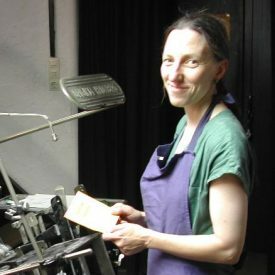 Basically the press is into classic relief printing, including wood and lino cut and letterpress using metal and wood type, plus binding artist’s books. The press is located in Germany, roughly at half-distance between Bremen and Osnabrueck. The workplace is located in an old red-brick farmhouse dating back to around 1893. When we first visited the place the stable was as it had been left when the cattle were moved out, which was in the late 1990s. The floor was laid with old trodden bricks, the worn old oak beams with the drinking troughs still mounted were covered in dust and cobwebs. The place had been mucked out and swept after the animals had left. The fork and broom were still laying there, as if waiting for the farmer to come back from a tea break. We took out the old bricks and used them to build a raised brick bed for herbs. Where the bricks had been there is a concrete floor now, a perfect base for the printing presses and type cabinets. The broom was structurally unstable due to wood worm damage, but we kept the fork.